There are several types of stone flooring used in living areas. Popular choices include limestone, marble, and slate. In general, stone floor cleaning is relatively easy because stone floors are fairly durable because they are usually sealed to minimize staining. These stone floor cleaning tips can help remove the dirt and grime of daily family life. Sweep stone floors daily. Remove dirt before it gets ground in. If you have a textured stone floor, vacuuming works better than sweeping. 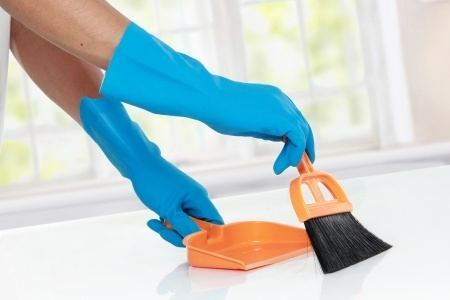 Immediately after sweeping, damp-mop the floor, using a clean mop that has not been exposed to strong cleaners. You need to damp-mop natural stone floors daily. Even with the modern sealers on the market today, stone floors are vulnerable to staining from water and oil-based liquids. Daily damp mopping may seem cumbersome, but if you're prepared for the job with a water-only mop hanging in a nearby closet, it takes just minutes for a shine that lasts the whole day. Wash your stone floors regularly with what the manufacturer suggests. But rinse rinse twice, so soil residues from rinse water don't dull surfaces. Squeegee away water to avoid water spots. Never use vinegar - it can strip the shine from your floors. If your stone floor has a polished surface, finish with paste wax. Skip this step if your stones are unfinished. Remember always clean up spills immediately. That way, you won't have to deal with water spots on the surface.